Khaled Said, Egyptian Internet activist, rapper and blogger, was brutally beaten to death by two policemen on 6 June 2010 in Alexandria. His death triggered massive protests and the Facebook page “We are all Khaled Said” became one of the main catalysts of the revolution. Khaled Said, has become a symbolic figure and the face of the revolution in Egypt. Khaled Said’s portrait is immortalized in Egypt in countless graffiti, street art murals and stencils in cities like Alexandria and Cairo. 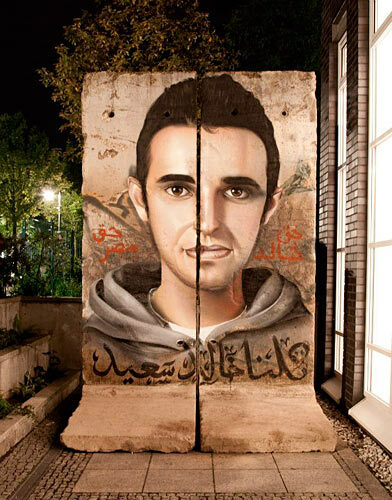 For Khaled Said’s sister it was very important to do him that honor in Berlin as well. The famous German photo realist and graffiti artist Andreas von Chrzanowski aka Case painted two original pieces of the Berlin Wall and finished the artwork during the award ceremony. The deeply symbolic painting will later be prominently placed at the Freedom Park on the banks of the river Spree. In October this year, the portrait will be painted again by Case in Khaled Said’s home town Alexandria, as part of a project with the Goethe Institute. A photo and video documentation by Joel Sames about the painting process will follow soon. This is a project by Don Karl, publisher and co-author of the book “Arabic Graffiti” & Hip Hop Stuetzpunkt Berlin – in collaboration with The Dudes Factory (Freedom Park) & Friedrich-Ebert-Foundation.